Art wasn’t an option for Bloomfield after school, as he needed a steady paid job. But one day, to be different, he painted a birthday gift for a friend. They hung the artwork up right away, which spurred him on to paint again, and he hasn’t looked back since. Bloomfield’s art combines ideas of his two favourite artists [Rothko and Gormley] by placing figures in stark and sometimes harsh landscapes with unyielding horizons. His favourite material is spray paint: “I often used spray paint as a teen when out creating guerrilla art with friends in London. The idea of using street material in a more traditional way appeals to me”. He prefers working with the cool tones of greys and black as it leaves more to the viewer’s imagination. The art Bloomfield creates comes from endless introspection and a variety of inspiration. His work is thoughtful and presented in an accessible way for a wide audience. In his own words: “Everyone should have an original painting in their home”. 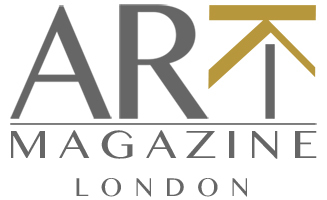 Arki magazine is your guide to art and architecture in London. Bringing you beautiful residential and commercial interior designs as well as local, talented artists and unique business meeting locations.